(TibetanReview.net, Feb10’16) – China has detained two high-ranking Buddhist monks in Draggo (Chinese: Luhuo) County of Karze (Ganzi) Prefecture, Sichuan Province, apparently for their involvement in a prayer service for the good health of Tibet’s exiled spiritual leader, the Dalai Lama, held at their monastery on Jan 25, said Dharamshala-based Tibetan centre for Human Rights and Democracy Feb 8. The Centre said the detention likely took place in the first week of this month. 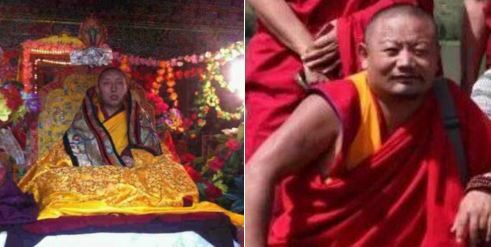 The detained monks have been named as the abbot Pagah and Geshe Orgyen. Pagah, nearly 40, is originally from Tsogo Township in Draggo County while Orgyen, about 50, is from Tehor Township.Pagah had completed his religious education from Drepung Monastery in Mundgod and Orgyen from Sera Monastery in Bylakuppe, both in the south Indian state of Karnataka. The prayer service took place as a part of an annual religious gathering at the Chogri Monastery in the county’s Tehor Township and both monks and lay people in their hundreds took part. The prayer service was held after it was reported that the Dalai Lama was receiving treatment for a common prostate condition in the Mayo Clinic at Rochester in the US state of Minnesota. Following the news of the prayer service, the local authorities, on Jan 31, issued an order requiring all shops in Draggo County to stop displaying, selling or stocking pictures of the Dalai Lama. The Tibetans were given a deadline of Feb 2 to surrender all such pictures in their possession, after which severe punishment was to follow for defaulters. The centre said that following the detention of the two senior monks, the authorities deployed a large number of Chinese security forces to monitor and control both the monastic and lay Tibetan communities in Tehor.